In looking back at the practice of diplomacy in 2018, it wouldn’t be farfetched to dub it “The Year of the Summit,” particularly in Asia, as the introduction to our cover package argues. The year opened with the world fearing a possible military conflict on the Korean Peninsula following months of heated rhetoric from US President Donald Trump and North Korean leader Kim Jong Un. But as was quickly shown by the subsequent summits between South Korean President Moon Jae-in and Kim, and between Trump and Kim, dialogue among leaders determined to change the course of events can have an impact on re-calibrating discourse, even when the thorniest differences remain. Only the future will tell where current efforts to address the many contentious issues on the Korean Peninsula will lead, but if they ultimately succeed — even several years hence — the high-level meetings that marked 2018 will be seen as historic examples of the power and promise of summit diplomacy. 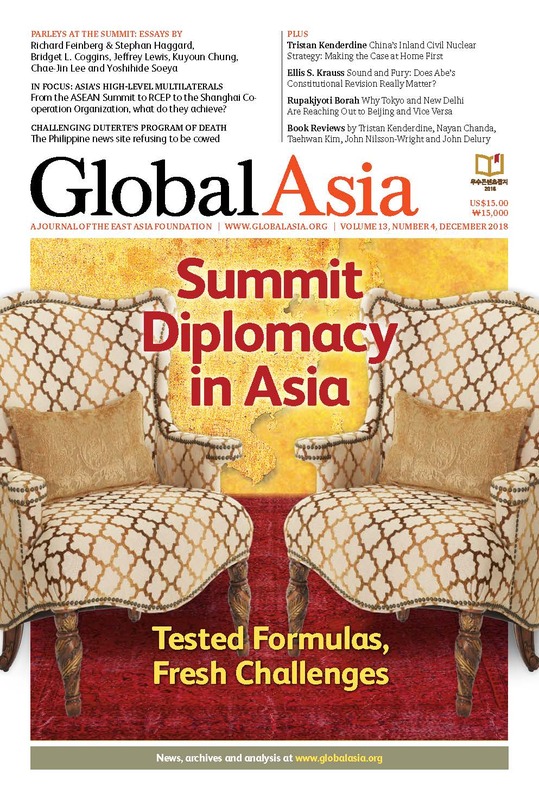 In this issue of Global Asia, we take an in-depth look at the exercise of summit diplomacy in Asia, not just with regard to the Korean Peninsula, but also to the many issues that threaten stability in relations among China, Japan and South Korea, as well as the wider role of the United States in the region. 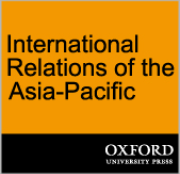 We expand the remit of that inquiry in our In Focus section, examining the emergence in recent years of a variety of forums that are increasingly institutionalizing summit diplomacy in Asia — from the Shanghai Co-operation Organization to the Belt and Road Initiative to regional trade negotiations. This complex mosaic of summitry is vital in its own right as an opportunity for high-level dialogue, but also threatens to become a venue in which the regional rivalry between China and the US could play out. 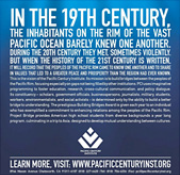 The articles on summit diplomacy presented here have their origin in a conference held on Oct. 29, 2018, at the University of California, San Diego, sponsored by the School of Global Policy and Strategy, the Korea-Pacific Program and The Asia Research Fund. In our Features section, we explore the implications of China’s inland nuclear-power policies for developing countries, as China seeks not only to vastly expand the development of nuclear plants along its inland waterways, but to export that technology to emerging economies around the globe; we examine in detail Japanese Prime Minister Shinzo Abe’s determined effort to amend Article 9 of the country’s constitution, which prohibits Japan from going to war and maintaining a military, and ask whether those efforts really matter, after all; we reveal the complex challenges India and Japan face in seeking to navigate the Great Power rivalry between China and the US; and we lay out the extent of the risks that Philippine President Rodrigo Duterte’s latest assault on a prominent journalist means for freedom of the press in one of Asia’s bastions of a vibrant media. 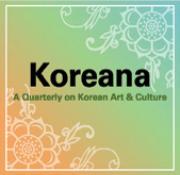 Our book review section, meanwhile, highlights a wide range of the most engaging recent works on Asia. The potential of summit diplomacy to break deadlocks in seemingly intractable problems in international relations was on full display earlier this year, with summits between the leaders of South Korea and North Korea, and the historic summit in June between Donald Trump and Kim Jong Un, reversing, for now, what seemed to be a collision course between Washington and Pyongyang. The hard work, however, lies ahead. Summits in the last two years have been important markers in the evolving diplomatic landscape in the region. 2018’s North Korean heads-of-state meetings are part of a broader history of summit diplomacy in Asia. After Singapore, Can Sizzle Be Replaced With Steak? The unprecedented Trump-Kim Singapore summit held promise for a breakthrough in the US-North Korea conflict — but the lack of follow-through raises doubts. Has Singapore Led to Real Gains on the North Korean Nuclear Question? If one digs into the details of what is possible, there is a path toward a less dangerous Korean Peninsula. Difficult issues still lie ahead and the process must face a shifting political reality in Washington. China’s president is cautious enough not to let his summits with both South and North Korea destabilize relations with either. Can Abe Get Japan Back on the Korea Bus? The prospects for an Abe-Kim summit — and how Japanese policy will have to adjust to make it happen. But after rapid domestic expansion, Beijing’s blueprint envisages vastly expanding China’s role in nuclear power generation in developing economies worldwide. The prime minister’s push to amend Article 9 — on Japan’s eschewing of a military force — has triggered much debate. But other contradictions embedded in that debate make it less crucial than it appears. Uncertainty surrounding the Trump administration’s foreign policy, among both allies and adversaries, has introduced a new dynamic in relations among China, India and Japan. In taking on the widely respected journalist Maria Ressa and her pioneering website Rappler, Philippine President Rodrigo Duterte may have met his match. Media freedom is at stake. Can the China-initiated grouping be as effective in promoting economic ambitions as it has been in pursuing security matters? The 2017 forum in Beijing attracted many world leaders. But it not yet clear if it can be a new venue for Chinese influence. If the three leaders could together address regional and even global problems, their summits could help peace and prosperity in Asia. Pressure is on for China and other countries to complete the Regional Comprehensive Economic Partnership trade agreement. It will be hard work. Red Swan: How Unorthodox Policy-Making Facilitated China’s Rise, by Sebastian Heilmann. Vietnam: An Epic Tragedy, 1945-1975, by Max Hastings.